Ruijie RG-S5750-H Switch Series is a collection of next-gen multiservice switches, offering remarkable performance and enhanced security. Implementing an industry-leading hardware design and Ruijie’s latest RGOS11.X modular operating system, the switches offer better table capacity, improved hardware processing performance, and easier user operation. RG-S5750C-28SFP4XS-H is member of RG-S5750-H series family. The RG-S5750-H series supports flexible Gigabit access and high-density 10G port scalability. All models offer fixed 4 10G fiber ports and dual expansion slots, supporting high-density, high-performance port uplink performance. These leading features fully meet requirements of high-density access and demanding aggregation. 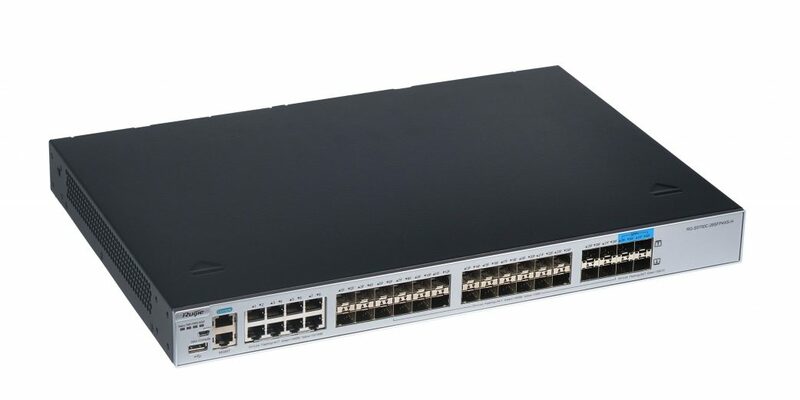 The RG-S5750-H switches, with the outstanding performance-to-price ratio, are ideal acting as aggregation of large-scaled networks, core of small to medium-sized networks, and data center server access. With the end-to-end service performance, and a wide range of security settings available, the RG-S5750-H switch series fully satisfies high-speed, secure and intelligent demands of enterprise networks.